Dental implants are a modern and aesthetic way of replenishing missing teeth, without unnecessary grinding and interfering with healthy teeth. Through a precise procedure, a dental implant is placed in the bone, the so-called an artificial root to rebuild a beautiful porcelain crown that replaces the tooth. At Luxdentic, we provide implantation of dental implants at the highest world level. Dental implants at Luxdentic are proven implant systems Straumann and AnyRidge, guaranteeing the durability of implants and the effectiveness of treatment. Our implantologists have many years of surgical experience supported by certificates of national and foreign universities and are members of prestigious implantological associations. Currently, implantological treatment is one of the safest and predictable methods of treatment aimed at supplementing tooth deficiencies. Medical data show that the percentage of implant integration with the bone is about 96-98%. The remaining several percent are caused by various risk factors, such as bad oral hygiene, smoking, non-compliance after the patient, osteoporosis, and diabetes. It is a kind of special screw that screwed into the jaw bone or mandible replaces the root of the missing tooth. It does not require unnecessary grinding and interfering with neighboring healthy teeth. At Luxdentic, we only use titanium and titanium-ceramic implants (Roxolid). The implant, when placed in the bone, grows together with it. This stage is called osseointegration and lasts about 2-3 months. The implant is implanted under local anesthesia, thanks to which the patient feels comfortable and the procedure is completely painless. The period of implant-to-bone growth, called osteointegration, lasts about 2-3 months, depending on whether it is barks or jaws. This time may vary depending on the patient’s health status, type of implant, bone quality and quantity, and the implant site. After about 2-3 months, a crown, prosthesis or a prosthetic bridge is placed on the implant with the help of (special) prosthetic connectors. We use titanium connectors or equally durable but more aesthetic zirconium connectors. In the case of the front teeth – due to the high aesthetics – we usually use all-ceramic crowns, identical to the Patient’s own teeth. In Luxdentic clinics we use the best implantological systems, tested by our doctors and selected for the needs of our patients. These are Straumann and AnyRidge implant systems. The warranty for these implants is lifelong. Check our limited offer for dental implants with prosthetic reconstruction (porcelain crowns, prosthetic bridges, implant-based dental reconstructions). I already have an implant and what's next? Can implants be implanted immediately? Dental implants can be implanted in the same surgical procedure, in which the tooth is removed or after the injury or after some time without a tooth, even for years. It will always depend on the patient’s state of health and will be decided by a specialist doctor. Can implants be used once I am ill? Diseases such as diabetes, osteoporosis are not always absolute contraindications and if they are diseases controlled by a doctor, therefore you should inform a specialist about them so that they can make the right decision. Is it possible to do dental implants during pregnancy? In the case of pregnant women, it may be recommended to wait and implant dental implants after delivery, although this will depend on the time needed to carry out implantation of dental implants and the degree of pregnancy. In each case, the specialist doctor decides. How long does the implantation last? The implantation of one dental implant takes about 15 minutes. The duration of the entire procedure depends on the number of implants. The length of further treatment depends on the Patient’s needs, including, but not limited to, the patient’s bone conditions and the planned number of implanted teeth. The implantation of the dental implant is not more painful than typical dental procedures and can be performed under local anesthesia and sometimes with general anesthesia. There is a possibility of small edema, but the discomfort associated with them is comparable with those after the standard procedure of tooth extraction. These ailments can be relieved by using commonly available drugs and the patient can return to normal functioning on the same day after the surgery or a few days after the surgery. How to take care of the oral cavity after having dental implants? After implantation Patients should avoid situations threatening the treatment, i.e. infections and smoking. Proper hygiene and care for oral health will help prevent the occurrence of infections. Smokers are at greater risk of disturbing osseointegration (integrating the implant into the bone) because tobacco constricts the blood vessels, which results in reduced blood supply and thus disruption of the normal osseintegration process and increases the risk of unsuccessful integration of the dental implant. 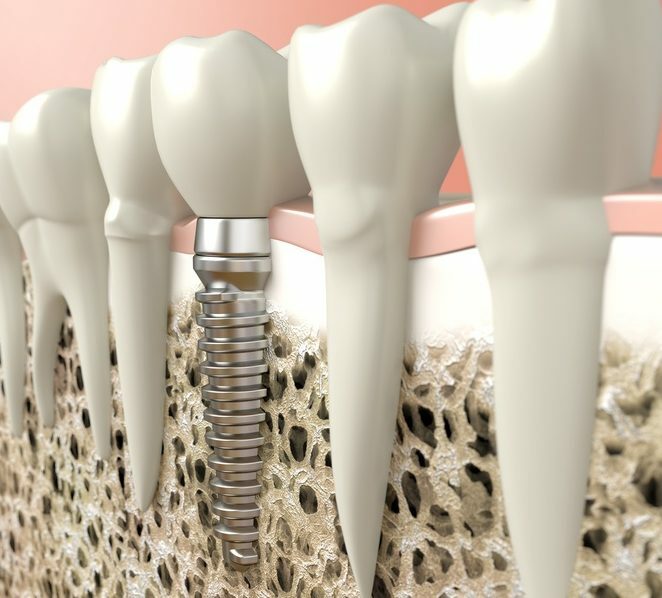 Excessive pressure on the recently implanted dental implant may cause its displacement and disruption of the process of bone adherence, therefore, it is important to pay attention to the diet indicated by the attending physician. Is there a difference between dental implants and natural teeth? No, the difference is imperceptible. No. It is practically impossible to distinguish a natural tooth from a tooth supported by a dental implant, you probably know people who have implants that you have not noticed. Whether dental implants are detected by metal detectors? No. Dental implants are made of titanium and are not detected using these systems. If I am allergic to metals, is rejection of the dental implant possible? Titanium, from which dental implants are made, is a metal that does not show any toxic or irritating reaction to living tissue, which means that the body does not recognize it as a foreign body, hence the occurrence of rejection or allergic reaction to this type of material is practically impossible. Who can do the implantion? The implantation treatment is performed by a surgeon who is a specialist with extensive knowledge in the field of anatomy, pharmacology and implantology. He graduated from the Medical Academy in Warsaw. Since 1999, he has been actively involved in dental implantology. He is a member of the National Association of Dental Implantology. In 2009 he obtained the title of implantologist at the University of Frankfurt. He participated in many conferences and courses in Poland and abroad – in Sweden, Germany and the United States. In 2012, he completed master studies in implantology at the University of Frankfurt. Has clinical experience in many implantological systems. 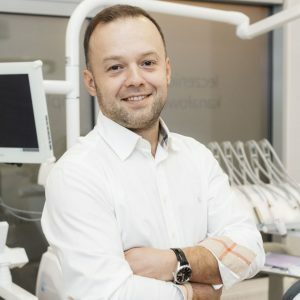 His main professional interests are related to advanced implant surgery, augmentation techniques and various methods of Patient’s prosthetic reconstructions.